Our 25,000 sq. ft. facility is stocked with the tools and machinery necessary for our line of work. 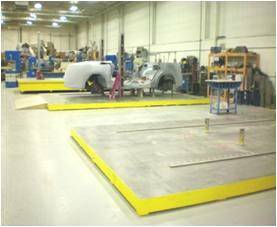 This includes three elevated plates for vehicle builds and four computer-driven mills on-site. Maximum Table Loading Capacity: 3,500 lbs. Maximum Table Loading Capacity: 2,200 lbs. Maximum Table Loading Capacity: 660 lbs.